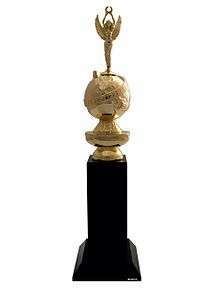 Honorary Golden Globe Award for "outstanding contributions to the world of entertainment"
The Cecil B. DeMille Award is an honorary Golden Globe Award bestowed by the Hollywood Foreign Press Association for "outstanding contributions to the world of entertainment". It was first presented on February 21, 1952 at the 9th Annual Golden Globe Awards ceremony and is named in honor of its first recipient, director Cecil B. DeMille. Honorees are selected by the HFPA board of directors and are presented annually (except for 1976 and 2008). The first woman to receive the honor was Judy Garland in 1962 who, at 39 years of age, was also the youngest honoree ever to receive the award, while Samuel Goldwyn, at the age of 93, in 1973, was the oldest. The first African-American to receive the honor was Sidney Poitier in 1982. *The 2008 awards ceremony was cancelled due to the 2007 Writers Guild of America strike; the HFPA deferred the award to the 2009 ceremony. **Woody Allen's Award was accepted by Diane Keaton. ↑ "The Cecil B. DeMille Award". GoldenGlobes.org. Retrieved October 9, 2011. ↑ "Spielberg Globe honour 'deferred'". BBC News. January 9, 2008.